Greenleaf's The Trouble with Angels v Surigo OFA EXCELLENT with normal Elbows! She joins her Dad CH Cross Timbers BlackMale and her sister CH Greenleaf's Deuce of Clubs v Surigo in the OFA EXCELLENT Club! Best of Breed under Judge Bart Bartley. Thank you Bill Tank! New Champion - 5 point major under Lanalee Jorgenson-Law!!! Deuce, Cooper daughter, finishes her Championship! Thank you Jennifer Root! Marie and Babycakes finish their Championships! 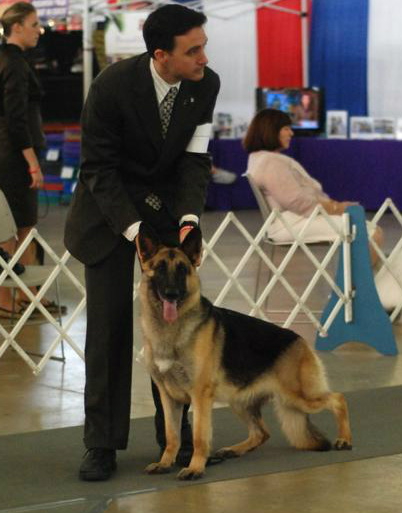 Deuce takes second place in the 9-12 class at the German Shepherd Dog Club of America National Show in Denver. Cooper, who hasn't been shown since winning Winners Dog from a 6-9 puppy class, gets 4 point major under Dean Wylie in Glen Rose. WOW! Champion Cross Timbers Babycakes finishes her Championship in just a few short months! Thanks Brian! NOW IT'S Multiple Group Winning Champion! Now it's Multiple Group Winning Ch. 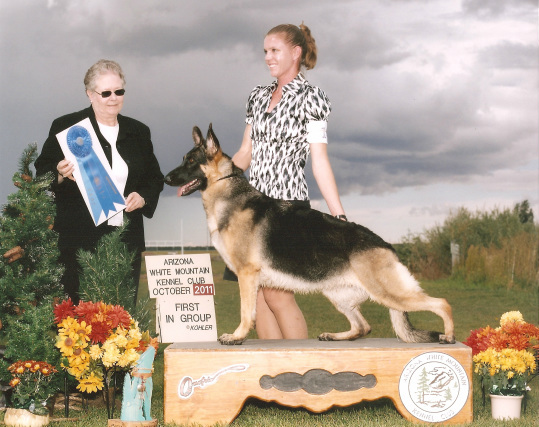 Kimber's Sweet Escape sired by Ch. Cross Timbers San Francisgogh. Congratulations to owner Kim Schooley and breeders Kim Schooley, Tracy Radigan, & Ben Bigornia. Puppies available from Ch. Kimbers Sweet Escape!